New York Marble is certainly a statement material in any space. This variety of marble is a natural stone so it is durable and offers the same qualities as its other natural stone counterparts. This brilliant white marble strikes us with an iconic lilac vein that usually runs generously across any given slab. The name of this material is misleading, as it actually quarried in Europe, usually Turkey. The depth of detail in the veins are not to be missed. 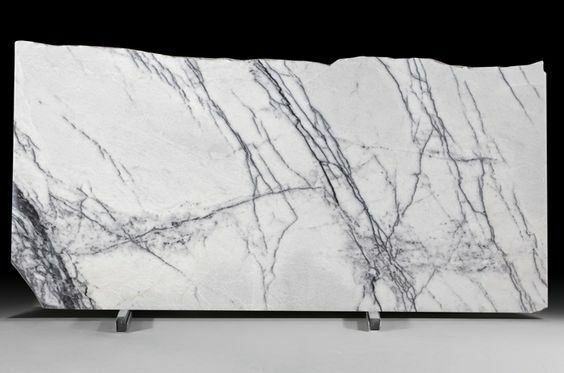 This decorative feature allows the New York Marble to best be utilised as an elegant bench top, interior flooring or as a feature piece like a splash back or wall trim. The crisp white base of the New York Marble can make a space feel open and fresh. When used to considered scale, it can create a huge design impact, especially when combined with complimentary materials such as timber and metal. If you really love the New York Marble look however, you may choose to go all out and feature it exclusively. It's seen below on walls, floors, vanity, bath recess, the works!! Accompanied with the subtly of silver trims and white porcelain bath and sink, this look is just...wow. Be prepared to experience a space you and your guests will never forget as this elegant stone really knows how to set the sophisticated vibe. 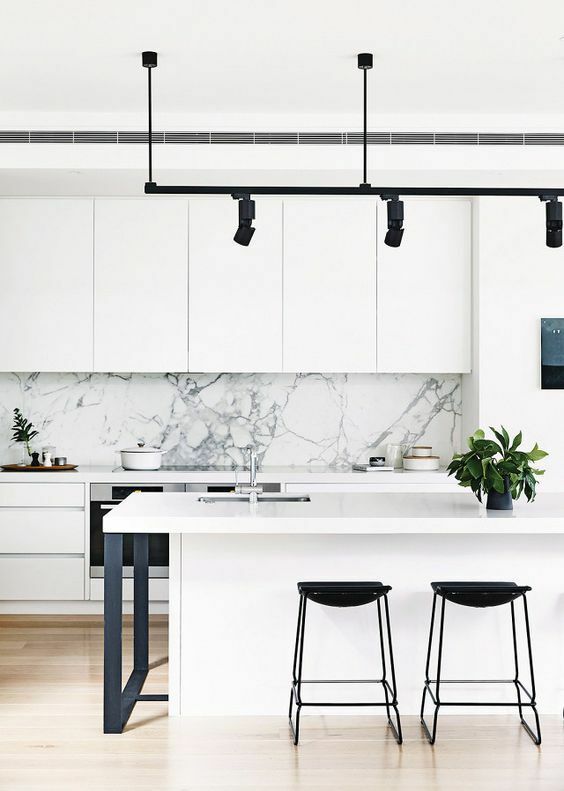 If the marble room is a bit much for you and your space, New York Marble is a perfect solution for introducing a design feature in an otherwise simple space. Black and white seems to pair really well with the brilliant white base of the stone, which draws your eye to the stunning organic veins. Because the veins are a deep lilac, you can also create quite a romantic and classic look with the New York Marble material. Drawing on the warmth of the undertones, pinks and purples pair nicely in a scheme for something more unique. The veins in this stone can be quite sharp (slab dependant) which works well with an industrial look and feel. The above bathroom vanity is just the right amount of character and colour to an otherwise simple space. It is really important to note that when working with natural stone, no two slabs are the same. Always ask your stonemason to grant you preview to the slab before committing, otherwise you may end up with something you are not in love with. If you are working on a project at the moment that requires stone, feel free to get in touch and we can assist you in specifying the right stone and sourcing a stonemason. CLICK HERE SO we can assist you in SOURCING the right stone and stonemason FOR YOUR PROJECT. All images are credited via direct links back to their sources.